Salzburg, Austria. The home of the Sound of Music. Salzburg was flooded with Mozart chocolates and the Sound of Music tours. We did not try either of those and instead decided to venture out to the Mirabell Gardens. On the way there, we saw a farmer's market, where there were all kinds of fresh fruits, vegetables, flowers, and more. It was kind of nice to randomly run into a farmer's market, since where I live, I have to seek them out and go on the according day. What was nicest about the gardens was that it seemed peaceful. While I was there, all I was thinking was that this place would be a great place to take outfit pictures for a blog post! It reminded me a bit of the Jardin du Luxembourg, but on a much smaller scale. A main difference was that here there were mostly people snapping pictures instead of sitting down with a good book. One thing that was really nice about the place was the shaded area on the side, (if you didn't know, it was really hot) where the trees were growing over a arch, creating a bit of tunnel effect by the trees, providing consistent shade to walk under. Don't get me wrong, walking through the middle of the gardens by the flowers and fountain is absolutely great, but even though it was morning at the time, it was pretty hot. 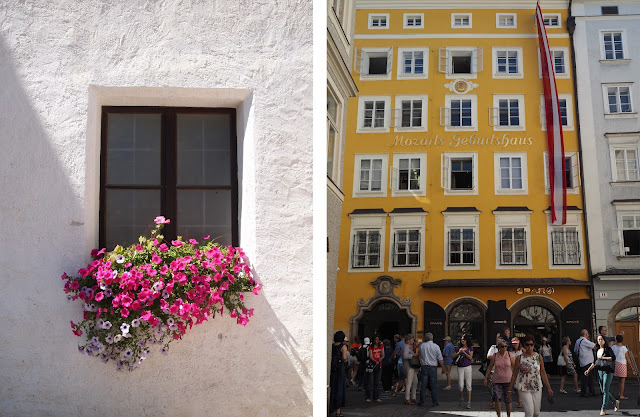 If the previously mentioned "Mozart chocolates" didn't give it away already, Salzburg is the home of the birthplace of Mozart. You can even visit it. I didn't go in, but I did see it as I was walking by. Mozart's family resided on the third floor of this building. The love lock bridge in Paris has started a movement. All around the world, I've been seeing bridges filled with locks, and Salzburg was no exception. While crossing the Makartsteg Bridge, there were all kinds of locks on it. The gift shops were also having a grand time selling heart shaped locks for the bridge right next to the selfie sticks. 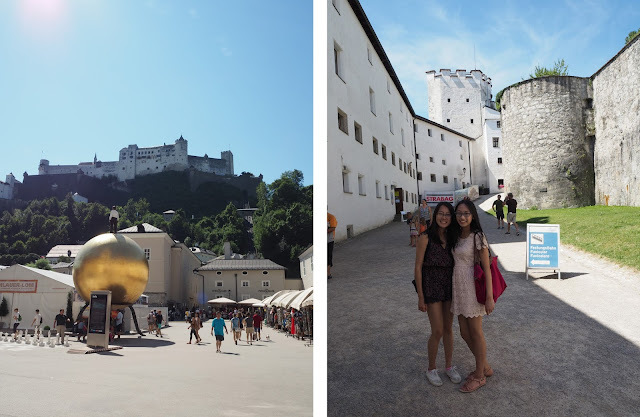 Later, we visited the Hohensalzburg Fortress. We had to take a tram to get up there, because it was on a hill, which is typical for a fortress. There's always a better vantage point on the top of a hill that just makes fortresses more effective. You could look around the fortress but you could also visit the museum, where we saw a pretty extravagant stove, armor, and other things. From the fortress, there was also a pretty great view of the city. After that, we decided to head out of the city to see a bit of the countryside and search for some landscapes with a Sound of Music vibe. We ended up at a lake, which I'll admit, I don't know the name of, that we noticed when we first arrived. The lake was vibrantly blue, unlike the brown rivers and lakes that I usually see. It was surrounded by mountains and little cottages lining the edges. We had dinner there at a restaurant located by the water.